I may have crossed the line with wild game. Nothing illegal, nothing immoral but still a socially questionable action. I cooked, ate and enjoyed road kill. Now this is not the first time I have done this, but is it certainly the first time I have ever eaten deer. I went for a run a few days back, a simple little 3 mile thing. I ran up through the Deer Flat National Wildlife Refuge parking lot and when I made it to the main road entrance the road starts down a hill. The run was proceeding well, and then my dog bolted ahead of me to sniff something in the burrow pit. It was two dead deer. Normally a single dead deer along the road is road kill, open and closed. But two deer, lying next to each other, made me suspicious. I stopped my run, called Idaho Fish and Game poaching hotline and reported the dead deer. Shortly after the IDFG officer called me and we spoke over the phone. He said it was a case of the “double tap” with a fawn following mom and both getting hit. He said since it was not a case of poaching that if I wanted either of the deer I was welcome to them. The larger doe was clearly distended – her belly was a great deal larger than it should be. The fawn looked fine. It had been cold, 1° outside, so I figured the meat would be just edible. With a little trepidation and a printed “road kill” form from IDFG I went back and grabbed the fawn. It was about the size of my Labrador/ Ridgeback dog. Roughly 100lbs. I tossed it up on the gambrel in the garage and skinned the hind legs. Then I when I got the stomach section funky things started to happen. The smell of gut-shot game became very prevalent. That bitter stomach acid smell, then the stomach lining under the skin started to turn green. I stopped skinning the animal. I lurched a few times – and feared I would lose my breakfast. I reexamined the deer. Now totally thawed the front legs felt like mush. Both shoulders clearly broken and the poor things head was caved in. Classic broadside road kill. 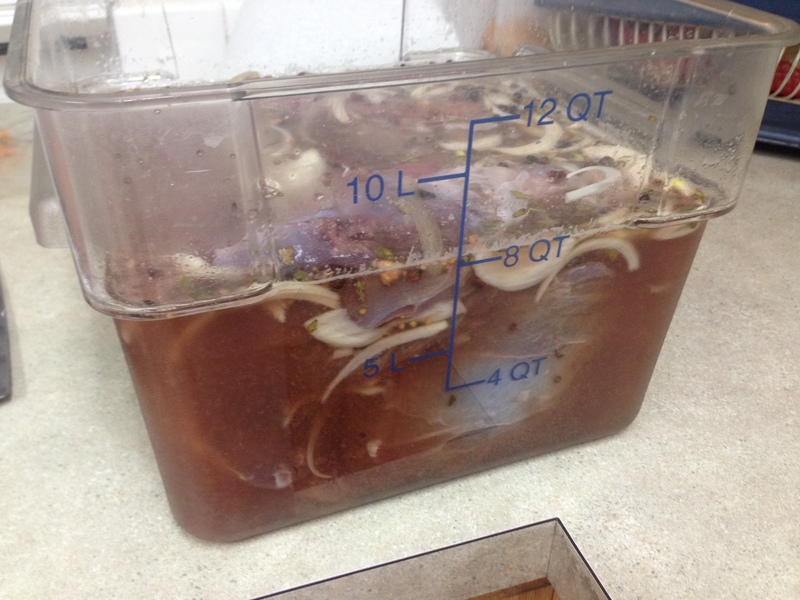 Wanting to finish what I started quickly I pulled off the backstraps and then cut the hind quarters off the carcass. The rest of the fawn went into a large trash sack – the smell of the stomach acid turned me off the whole project. I brought the meat into the house and deboned it. I honestly could not shake the gut shot smell from my nose. Each time I smelt the meat it would seem sour to me. My nose said it was turned, my brain knew otherwise. It was flat impossible for the meat to have gone bad by the time I had gotten to it. The doe and fawn were hit the night of Dec 31st, I found them at 9am the next day. No way had the meat gone bad. But the smell still stuck in my nose. A week later I boiled the leg meat for a solid 3 hours. When it was done cooking it was moist, tender and full of that nice corned meat flavor. I rubbed the backstraps in black pepper and smoked them. They came out way to salty, but fixable. The boys and I enjoyed a dinner of corned venison and cabbage soup. Very cool. I wish I had a drive I used more frequently so I could monitor which roadkill was fresh. The first deer my mother hit (of three) was recovered. Once she finally limped her truck home, she told my dad where she’d hit it. It was a big, ~280lb white tail buck. 8pointer, though the force of the impact had snapped an antler off. Turns out, she’d been driving between two pastures of dad’s buddy. He called his buddy, and they field dressed the deer in the cow pasture. Only one of the hind quarters was ruined. She refused to take any of the meat, though. 280 lbs! That’s a toad of a buck. Mine was not even 1/3 that size.